….that is the question. Hi guys, Aunt Geri here. In fiber art, some things aren’t random or spontaneous. 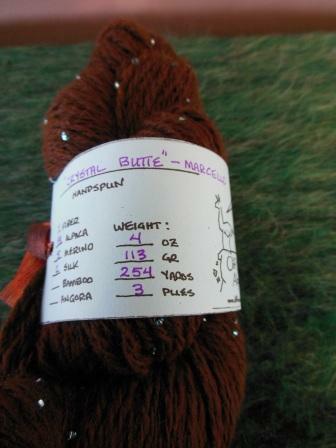 The idea for this yarn came to me months ago-when I first spun Marcello, but I didn’t have the right beads on hand. I found the perfect gold-lined aqua beads at the Trading Post, but then I didn’t have the right yarn to string the beads onto. 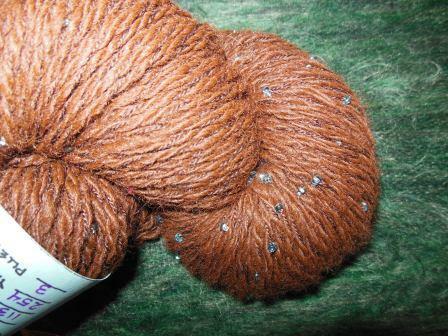 I string beads on yarn, and I generally use a silk blend for strength-alpaca singles are too fragile to handle the friction from moving the beads. 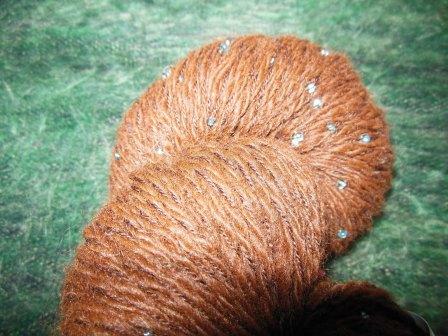 I recently found a great brown superfine Merino/silk lace yarn that I used. This is Marcello’s fiber spun into yarn. I spun two spools of Marcello before Christmas, so all I had to do was string the beads and ply the three strands together. Placing one bead every seven or eight inches takes approx. 1300 beads-strung along 250 yards of yarn. This takes a very long time. Next week I’ll talk about how yarn “blooms”. This entry was posted in fiber art and tagged alpaca yarn, beaded yarn, beads, fiber, handspun yarn, yarn. Bookmark the permalink. 5 Responses to To Bead or not to Bead…. Very nice. How do you string the beads? Is it by hand? It is all by hand! I use a dental flosser that is very similar to stiff fishing line – except it has a loop in it. You put the yarn in the loop, feed the beads onto the flosser, slide them onto the yarn. 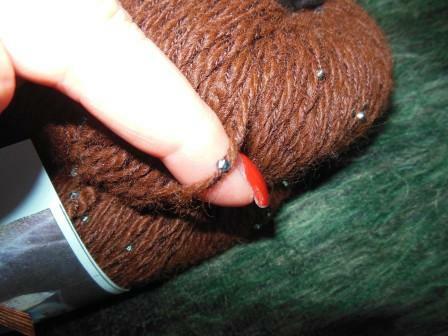 Then I move the beads or portion the yarn into about 10-yard “zones” and park the needed beads every 10 yards. That way you are only pushing about 70 beads as you drop them into the ply versus the total 1300 beads. It seems to work and I have yet to figure out a more efficient method. Thanks for explaining that aunt geri. Do you put a knot between the 10-yard zones? 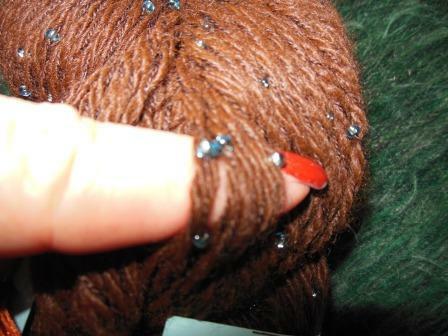 I can’t quite understand how the beads remain properly spaced for knitting otherwise? No knots – I end up “placing” the beads about 7 inches apart as I ply the yarn, so the beads are already in place when you knit with the yarn.